Today, e-commerce sites have gathered an unmatched level of knowledge of their customers’ buying patterns, and use that data to optimize the guest experience. 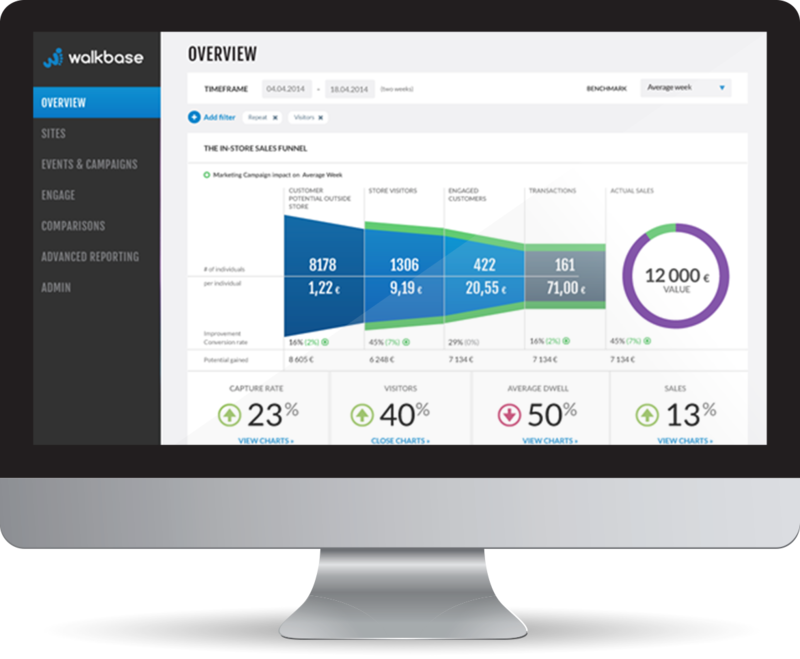 The Walkbase Retail Platform brings the same dynamic responsiveness of e-commerce to brick-and-mortar stores today. Use existing store Wi-Fi or install low-cost Walkbase sensors with Wi-Fi and Bluetooth beacon. Collect opt-in from customers via customer Wi-Fi or app to enable one-to-one marketing capabilities and multi-channel retargeting. “Listen” for Wi-Fi and Bluetooth sensor signals to locate customers in real-time based on anonymous pings from smartphones. Use data to personalize marketing in all channels and improve store operations with real-time analytics and reporting. Aggregate and process the data in real-time over a secure network. Integrate other relevant data sources including: point of sale, people counters, digital signage, CRM/loyalty, web analytics and staffing.